Japanese who lives in London recommends top 3 fast Japanese food restaurants in Japan! There are so many nice foods, places and activities in Japan. I grew up in Japan (very country side) and had lived Tokyo for 15 years. I would like to recommend you top 3 wonderful Japanese quick restaurants in Japan. I hope this information will be of some help! First of all I would like to introduce the most famous Japanese quick restaurant called 'Yoshinoya'. Yoshinoya is famous for its Gyuudon (=rice bowl with beef). Yoshinoya also provides some other foods and they are very delicious compared with thier prices. I would like to recommned you to try 'Gyuudon' at first. There are some toppings for Gyuudon so I suggest that you should choose 'with egg' . It costs just only additional 50 yen (=about 50 cents or 50 penny). If you are okay to eat raw egg, you should order egg. There is one more reccomendation from me, that is 'with a lot of soup'. That is called 'tsuyu-daku' in Japanese. The shop staff in Yoshinoya would make a with a lot of soup Gyuudon with no extra cost. You can order this combination as 'Gyuudon, normal size with egg and a lot of soup!'. In Japanese it is 'Gyuudon, Nami (standard), Tsuyu-daku (with a lot of soup), Tamago (egg)'. Matsu-ya is rival restaurant against Yoshinoya. It prvides some more variety of its menu. It also provides Gyuudon as well as Yoshinoya. Somebody prefer Matsuya but I think it really depends on the person. For me, I would like to recommend not Gyuudon but different menu in matsuya. I recommend a bit different type of Gyuudon. It is a combination of Japanese curry and Gyuudon. It is called 'Curry-Gyu'. I think it is quite difficult to imagine the mixture of curry and Gyuudon! but actually it is fantastic. At first you should try Gyuudon taste first, then eat curry only. Then you should mix the beed and curry. It sounds like beef-curry but the taste is complety different from norml beef curry. By the way, for your Japanease lesson, 'ya (家 or 屋)' means shop/restaurant/shop. CoCo is very popular Japanease curry restaurant. They have many variery of Japanse curry. You can choose what you want to eat but the most typical one is Katsu-curry. 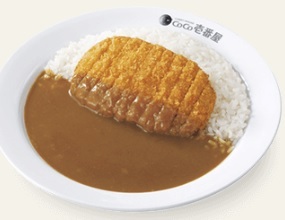 Katsu is fried pork and it will be one the top of rice then curry will be poured on the top of Katsu! I feel the taste is great! It is much more than beef curry. I would like to say that Katsu and curry is one of the best friend! Please try it! Are you interested in some of them?? In 2020 Tokyo Olympic will be held in Japan. Please come to Japan and I really hope you will enjoy and like Japan!! Thank you for reading my article! !